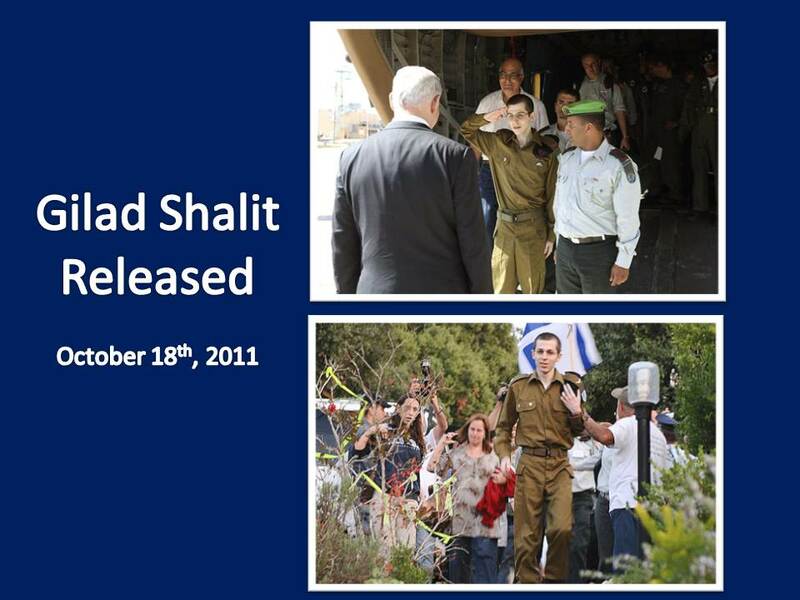 On October 18th Gilad Shalit, an Israeli soldier held hostage by Hamas for 5 years and 4 months was released. Each day, on the evening news, Israel counted the days of Shalit’s captivity 1,941. 1,027 is the number of Palestinian prisoners Israel agreed to release in exchange for Gilad. Many of them are murderers and masterminds of murder responsible for unleashing horror, terror, death and devastation on Israeli society. One 25 year old who sat in a dark hole, denied his most basic human rights… A prisoner while his friends learned to manipulate Facebook and Twitter, IPods and IPhones, travelled the world, went to college and (some even) got married. 1,027 criminals, including many murderers who have already proclaimed their pride for their deeds and spoken of how they would happily do the same again. How do you balance the life of one boy who needed to be freed against more than a thousand who have already proven themselves very capable of hurting us? What do you say to the bereaved families who were promised that those responsible for the death of their loved ones would rot in jail for the rest of their lives? What do you say to the future families who will be bereaved and injured by the terrorists set free? What do you say when the next Israeli is kidnapped and held hostage by terrorists who desire the release of even more prisoners? Like a trapped wild animal the people of Israel gnawed off an arm and a leg in order to save the heart. The people of Israel are fierce. What is more fierce than a mother defending her cub? We hurt ourselves deeply to save the one who needed rescuing NOW. People watched television at home, at work, at shopping malls… waiting to see Gilad alive, waiting to see him come home. First we heard that Gilad had been recognized by the Egyptians and that he was ok. Good news but we wanted to see him. No one had seen him for two years…. Next we watched as Gilad was interviewed by an Egyptian reporter. Painfully thin and in obvious shock (to suddenly be around so many people and so much light) we watched Gilad answer the barrage of questions thrown at him by the reporter. Helplessly we witnessed this psychological battering; proudly we listened to Gilad’s thoughtful, measured responses. The years of captivity and loneliness had not driven him out of his mind. He was weak and it looked like each breath came with difficulty. We breathed with him as he spoke, as if we could breathe deeply for him, instead of him, infuse him with oxygen and return his strength. We waited to hear that Gilad had left Egypt, to hear that he was on Israeli soil. Doctors checked him to learn what kind of medical attention/rehabilitation he needs. He was given a fresh uniform to wear home. And he called his parents. Next Gilad was taken by helicopter to the army base where his parents were waiting for him – “Air traffic control we are 7 minutes from landing. We are, bringing Gilad home”. The nation watched as the helicopter landed and the door opened. The door opened and Gilad came out. Thin and weak, it looked like he could barely breathe. When he saw that Israel’s Prime Minister Benjamin Netanyahu was standing on the tarmac, waiting to greet him, Gilad pulled himself together, stood straight and tall and gave a soldier’s salute. We watched as Gilad hugged his father. What do you say to a son who has been sitting alone, in captivity for more than five years? What do you say to your dad? The Prime Minister wiped a tear from his eye as father said to son: “Come see your mom”. He was home. Finally. One could almost hear a collected sigh of relief. (In some homes there were also sighs of grief but no one felt capable of dealing with them. On this day the nation wanted to celebrate.) But celebrations could not begin until the Shalit family was back in their home, all of them together. We waited to hear the doctors’ decision – could Gilad go home or would he need hospitalization? Was he strong enough to make the ride to their home in northern Israel? Maybe he could be taken by helicopter? When it was announced that Gilad and his family would be brought home by helicopter the residents of the town and other well-wishers began gathering at the entrance of the community. The helicopter flew over and Gilad looked out from above seeing the sea of people waiting for him, celebrating his return. The helicopter landed outside the town and he was driven to his home in a van, through the multitude waiting to greet him. All these people were singing, dancing and waving flags just for him! Everyone wanted to see Gilad, to watch him walk into his home. We wanted to know that he is ok. He is one person – one boy, one man, one soldier. He could have been any of us. Save one life and it is as if you have saved the entire world. Remembering the Holocaust and Heroism in Israel: Am Yisrael Hai!